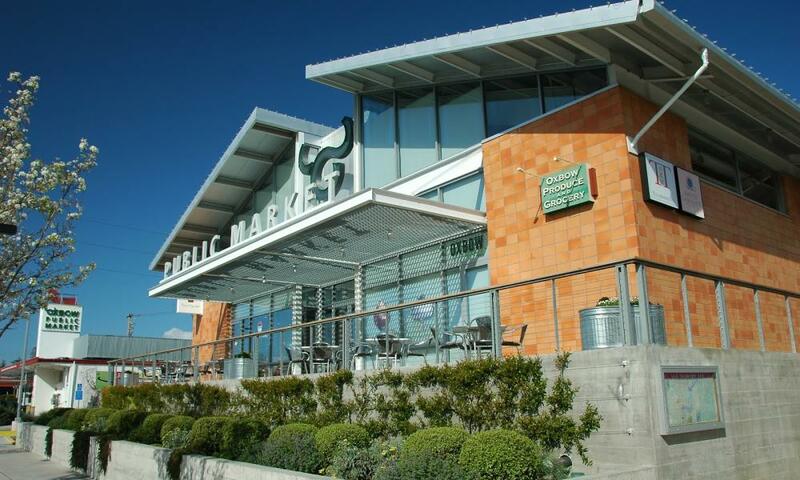 If you like San Francisco’s Ferry Building marketplace, you’ll love its country cousin — the Oxbow Public Market in Napa. As it happens, both properties were developed by the same guy, Napa Valley resident Steve Carlin, and are based on the same concept: showcasing a rich assortment of local food vendors, artisan cafes, and organic local farms, all under a single roof. It’s a winning strategy — both places are bustling, and they always smell like a million things you want to eat. The 40,000-square-foot Oxbow Market is a magnet for locals and visitors alike because it offers something for everyone’s palate, and it’s usually got something fun going on. The Market is open seven days a week — most of its restaurants are open until 9 pm, with later hours on Friday evenings. On Tuesdays, all its stores stay open until at least 8 pm for Locals’ Night. A few new vendors recently joined the Oxbow consortium: The popular butcher Five Dot Ranch has just opened Five Dot Ranch Cookhouse, with both dine-in and take-out menus, as well as beer and wine. And the Napa Valley Distillery — the first licensed distillery in the City of Napa since Prohibition — has opened its first retail store and tasting bar at Oxbow. On Friday, August 1, from 6 to 9 pm, Judd and Holly Finkelstein of Judd’s Hill Winery will present the fourth-annual “Uke-A-Palooza at Oxbow,” a special Polynesian evening with an appearance on the Oxbow River Deck by ukulele band The Maikai Gents. (Guests are encouraged to bring their own ukuleles to join in the performance!) And Polynesian-themed specials will be offered by Oxbow merchants, including $3.50 bottles of Kona Brewing Company beer, 10 percent off the Tiki Cocktail Mix at Napa Valley Distillery, carnitas tacos with pineapple at C CASA, $5 Judd’s Hill and FPWM wines by the glass at the Oxbow Wine Merchant, Mauna Kea caramel with sea salt at Annette’s Chocolates, and vintage beach and Polynesian clothing will be for sale by provided by Melissa Gruenhagen of Retro Diva. On Saturday, August 16 from noon to 3pm, the Napa Valley Heirloom Tomato Festival will be held on the River Deck. There will be talks with experts Peter Jacobsen of Jacobsen Orchards, Amy Giaquinta (“The Tomato Lady”), and UC Davis food scientist Ali Bouzari; a 25+ heirloom tomato-tasting event; cheese-making demonstrations, salt and olive oil pairings; tomato tartine with a perfectly paired glass of wine; and tomato-themed specials for sale throughout the marketplace. Tickets are $40/person ($20 for students) and are available here. On Thursday, August 7 at 7:30 pm, Oxbow and Five Dot Ranch will host a kids’ cooking class, “Make your own Meatball Sandwich,” and meatball sandwiches will also be for sale from 5 to 8:30 pm. At 8:15 pm, the market’s interior parking lot will become a “walk-up drive-in,” with a free showing of Cloudy with a Chance of Meatballs 2 (PG). Space for the class is limited, so sign up at www.oxbowpublicmarket.com, and arrive early to reserve a spot for the movie. Don’t forget your blankets and jackets.